Ecellent quality and a very economic price. Our Standard Dry Wipes have been developed to offer an economical alternative to other brands on the market, and are perfect for a range of cleansing tasks. Each super soft wipe comes packed into a re-sealable pack to maintain their construction while offering exceptional strength and absorbency. 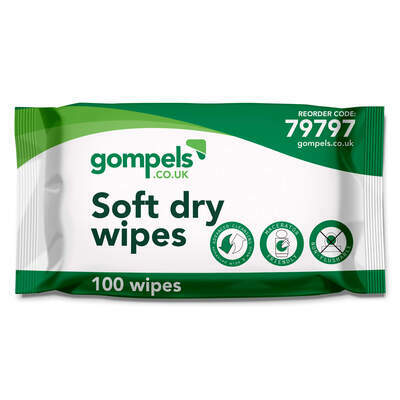 These dry wipes are gentle on all kinds of skin and can be used to apply patient creams and cleansing foams in care homes. They are also perfect for hand, face and patient cleansing with their disposable design that is free from chemicals and perfumes. We also stock these handy wipes in our Proform Large Soft Wipes 100 pack. If you're looking for more patient care items, we have a wide range available to purchase online from our Shaped Pads through to Powder-Free Vinyl Glove and Couch Rolls.